This video is part of the appearance, “Digital Transformation and Cloud First“. 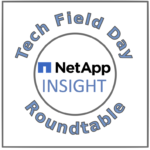 It was recorded as part of Tech Field Day at NetApp Insight 2016 at 11:30 - 12:30 on September 28, 2016. Gabriel Chapman, Principal Architect, discusses the transformation underway in modern IT organizations and how the shift toward DevOps and Cloud has forced professionals to take a hard look at how they are addressing new challenges and moving their technology forward.